Integral Movement Teacher — Chlorophyll Molecule - What Makes Plants Green and More! Chlorophyll Molecule - What Makes Plants Green and More! I became curious about chlorophyll since I noticed a lot of supplements and health food products listed it as an ingredient. I knew about the association between chlorophyll and plants, but what else could be important about this molecule that is abundant in plants? After learning how each chlorophyll molecule contains magnesium, an important mineral for more than 400 hundred enzymes systems and relaxation, I thought I would share this information and more on my blog. Enjoy! I am in awe of how complex and beautiful nature looks under a microscope. What makes the picture green is the chlorophyll found in plants! Wow! This picture includes two matrixes; one pertaining to hemoglobin and the other to chlorophyll. 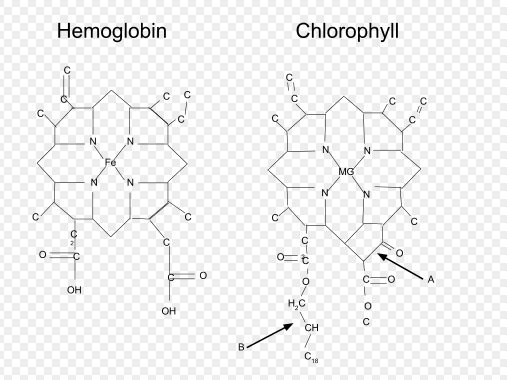 Both hemoglobin and chlorophyll are similar in atomic shape, but extremely different in their functions. While the iron-containing molecule, called hemoglobin, allows oxygen from the lungs to be carried to the rest of the body in red blood carrying animals, the magnesium containing molecule, called chlorophyll, allows light to be absorbed into energy for plant use. What is Chlorophyll good for? The fat soluble version found in plants can stimulate hemoglobin and red blood cell production - meaning it blood building andhelps with anemia symptoms. No RDA or ODA. Please talk to your nutritionist or doctor about it. For water soluble version: most over the counter supplements. Murray, M. Pizzorno, J. Pizzorno, L. (2005). The Encyclopedia Of Healing Foods. New York, NY: Atria Books. Murray, M. Pizzorno, J. (2012). The Encyclopedia Of Natural Medicine. New York, NY: Atria Books.